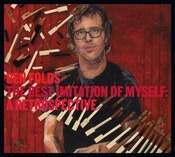 Today (October 10) is the day that Ben’s retrospective compilation Best Imitation of Myself goes on sale in the United Kingdom, and tomorrow (October 11) in the US. If you’ve picked up your copy (that is, if there are any record stores left where you are), have had it delivered, or have downloaded it, let us know what you think! Leave your review in the comments section of this post and we’ll publish the best ones and bounce them over to the Magical Armchair e-mail discussion list (you can subscribe as well, using the box to the right). Is your favorite concert-only song on it? A song from a show you attended? Something you’ve only heard on a fifth-generation mixtape or bootleg, finally in the clear? Let everyone know your first impressions, and enjoy!